Via We-make-money-not-art, artist Quentin Destieu has re-created and magnified the inner architecture of the 4004 processor so that its size would display its inner workings. The objective of the project was also to create a technological support free of copyrights and working on an open source model. Created in 1971, Intel’s 4004 was the world’s first commercial microprocessor. It wasn’t particularly powerful though. Its main function was originally to perform simple mathematical operations in a mundane business calculator. However, it wasn’t the 4004 itself that was important, but its architecture. The 4004 offered a radical new way of thinking and building processors. General purpose computers used to be room-sized equipment but the miniaturization of the 4004 made it possible to commodify computing. An extraordinary thing about the 4004 is that it was the first and the last hand-drawn microprocessor. The production of its successors would be so complex that it would be automated, performed on a micro scale by hi-tech machines. 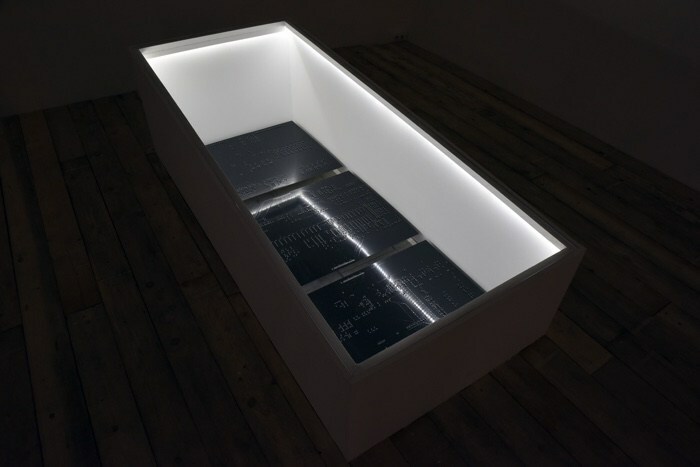 Read more about the 4004 and the exhibition on we-make-money-not-art.